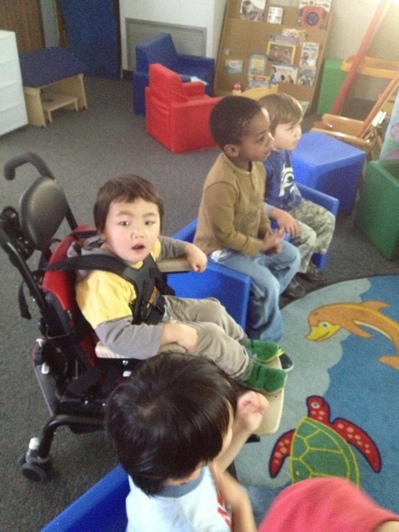 Today, I got some images from school showing the new chair that they got for Leo. It is the type that ties the upper body, giving more stability to him overall. They said he is participating more in various activities. But honestly, I felt devastated when I looked at the pictures... He could walk last year. Now he is tied to this chair to be safe... It just looked surreal, but it is the reality I need to face. We want this chair at home too, but it is very expensive. I need to speed up the application process for Medi-cal for disabled. His ankles are torched inside a bit and we have ordered ankle braces for that, but not yet ready. It's been more than a month. Leo. Your braces are almost ready, so let's get used to wearing them and practice walking together, ok?